Six to ten inches tall, with two slightly thickish leaves, and usually two slender flower stalks, each bearing a graceful cluster of starry, white, pink or pinkish-purple flowers, each petal delicately striped with pinkish-brown, the anthers pink, the ovary green, with three, tiny, double crests. These flowers are exceedingly delicate and pretty, growing among rocks in shady canyons. The bulb is usually red-coated. The flower cluster of Allium serratum is much more compact than the last and the pink flowers change to deep purplish-pink as they fade, making a pretty, round, papery head, about an inch and a half across. Common on low hills in California. Allium bisceptrum. 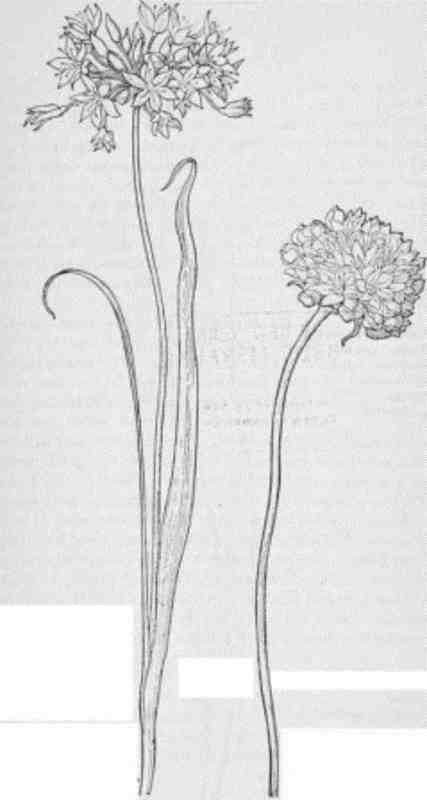 Allium serreatum. LILY FAMILY. Liliaceae. There are many kinds of Brodiaea, among the prettiest western flowers. They have a small, solid bulb, coated with brownish fibers. The stem bears a bracted, roundish head of flowers at the top, the pedicels varying in length. Their leaves, all from the root, are grasslike and soon wither and the flowers dry up, become papery, and remain on the stalk, sometimes keeping form and color for some time. The stamens are in two sets and are attached to the flower-tube, their filaments often winged. Sometimes three of the stamens are without anthers and their filaments are broadened, so that they look like small petals alternating with the ordinary stamens.